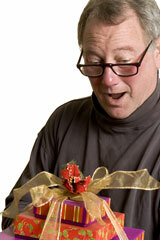 Wondering what to get your husband, Father, brother, or some other special man in your life? Whether it's a birthday gift or just a gift to say "I love and appreciate you," you have plenty of options. A young woman in a red top and white scarf gives a gift to a grateful man. The rectangular gift box is wrapped in gold paper and decorated with a green and gold bow. Soon the man will open the gift and discover the treasure inside. Yet looking for the perfect gift for a man can be a real challenge. While it's tempting to go with tried-and-true gifts such as neckties and wallets, more imaginative and thoughtful gifts will be more appreciated. The first order of business? Find out what the man in question likes to do. What are his hobbies or interests? For example, a man who loves to grill during the summer would probably love a gift basket filled with grilling accessories, seasonings, and a cookbook. Don't forget that sometimes the best gifts are intangible. Is Dad a gym rat? He's sure to appreciate it if you pick up his gym tab for the next year! Popular gifts for men include watches and leather goods, unique gadgets and tools, sports memorabilia and outdoor recreation products, grilling accessories, video games, bicycles and scooters, gourmet food baskets, car and travel accessories, books, office decor and desk accessories, recliners and relaxation accessories, and men's fragrances. If you know the man's hobbies, consider buying a hobby-related gift. For anniversary gifts, consider an anniversary year themed item. Three silk ties for men, in different colors and patterns, are photographed together. The ties include several different hues of blue, as well as red and gold. 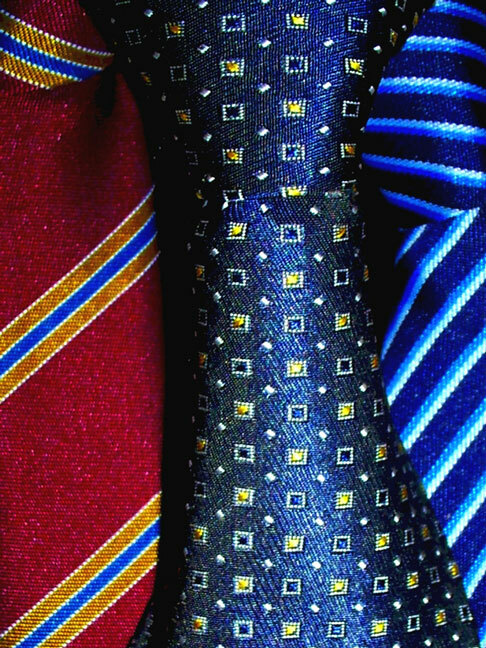 The ties on the left and right are striped; the tie in the middle features a pattern of little squares. Appropriate business gifts for men include food gifts, ties, and gift cards or gift certificates to local retailers or restaurants. It is customary to express one's appreciation to business and personal service providers during the holiday season. Some employers prohibit their employees receiving large gifts from customers, but gifts under $20 are not likely to be a problem. Appropriate tips are $10 or $20 for letter carriers and delivery service personnel, $25 to $50 for doormen depending on the type of service they provide, $20 for garage attendants where you regularly park, and $10 or $20 for trash collectors. Gifts For Dad - gifts for Father's Day or Dad's birthday. Gift and Home Trade Association - gift industry networking organization.